This article was written by Alan Duffy and Rebecca Allen from Swinburne University of Technology. It was originally published by The Conversation. We can map it, weigh it and simulate it, yet we still have no idea what it is. But dark matter is coming into the spotlight as never before. Astronomers now know that for every grams worth of atoms in the universe, there are at least five times more of a new, invisible matter neither shining or blocking light. We can also create model universes inside supercomputers that reproduce in stunning detail what we see around us in the night sky but only by assuming this invisible dark matter passes through us like a ghost. Finally, in the past decade we have begun to almost routinely map out the invisible, finding it matching the simulation predictions. Yet of the numerous candidates that particle physicists have thought up for dark matter we are still far from knowing which is right. A quest that is every bit as grand and in some ways even more difficult than the search for the God Particle, the Higgs Boson. In 1978, Vera Rubin and Kent Ford discovered that stars in nearby galaxies were not moving as expected. Stars far from the centre of a galaxy - where all the light (and hence mass) was concentrated - were moving far too quickly for the gravity of all the visible matter to hold onto them. Therefore, some unseen source of matter must be providing the extra gravity to explain the stars in the outer reaches of the galaxy. The idea of dark matter had been brought into view, but next came the question, what actually was it? Today, more than 40 years later, technological advances in astronomy have enabled astronomers to greatly expand on Vera Rubin’s pioneering work, and have found signs of dark matter in the motion of galaxies and stars everywhere. The motions of visible objects allow us to predict the dark matter distributions and these match the model universes created in supercomputers. Such observations and simulations have lead to the staggering realisation that the visible matter in our universe is the tip of the iceberg making up just 15.7 percent of all the mass. But understanding how dark matter interacts with visible matter is only part of the puzzle. A crucial clue to the identity of the dark matter is whether it interacts with itself, and if so how strongly? So how do you study the interactions of a particle you cannot see? The answer lies in gravitational lensing. Massive objects can bend the space around them and when they do this the path of light is also bent, in the same way that a lens does. Just like any prescription glasses, you can have strong and weak gravitational lensing. If there is a lot of mass tightly packed in a region then it strongly bends the light from background galaxies. This happens at the dense centre of galaxy clusters. At the edges of the cluster, where the mass is more spread out, the lensing effect is weaker and rather than an obvious warping of the background galaxy image you have a more subtle twist to their shapes. You can only be sure of this effect by averaging the twisting of dozens of background galaxy images making weak lensing a far more challenging observational tool but the only one that can map the dark matter in the outskirts of a galaxy cluster. It is also possible to look for dark matter self-interactions by studying how galaxies and galaxy clusters collide. When these massive objects pass through each other, there is a chance that the material they are made of will interact too. This chance is based on the object’s collision cross-section, which can be thought of as the target area it presents for another object to collide with. You also need to take into account the distribution of the objects. For example, while cars on Earth may collide head-on with a large cross-section, the chances of this actually occurring are far less likely if there’s not much traffic on the road. So too, stars might seem like big targets but they’re so sparsely distributed within the galaxy that they practically never collide in practice, we’d have to wait a billion times longer than the age of the galaxy for a star to hit our Sun! The gas that lies between the stars, however, will absolutely collide (the electromagnetic force ensures that tiny particles will present a much larger cross-section). So if two galaxies collide the gas slams together in a mangled car wreck while the stars sail by just missing each other. The dark matter may lie somewhere in between these cases, with candidate particles having a tiny cross-section compared to the gas, but more than the stars meaning after a collision a cloud (or halo) of dark matter will trail after the stars but ahead of the gas. 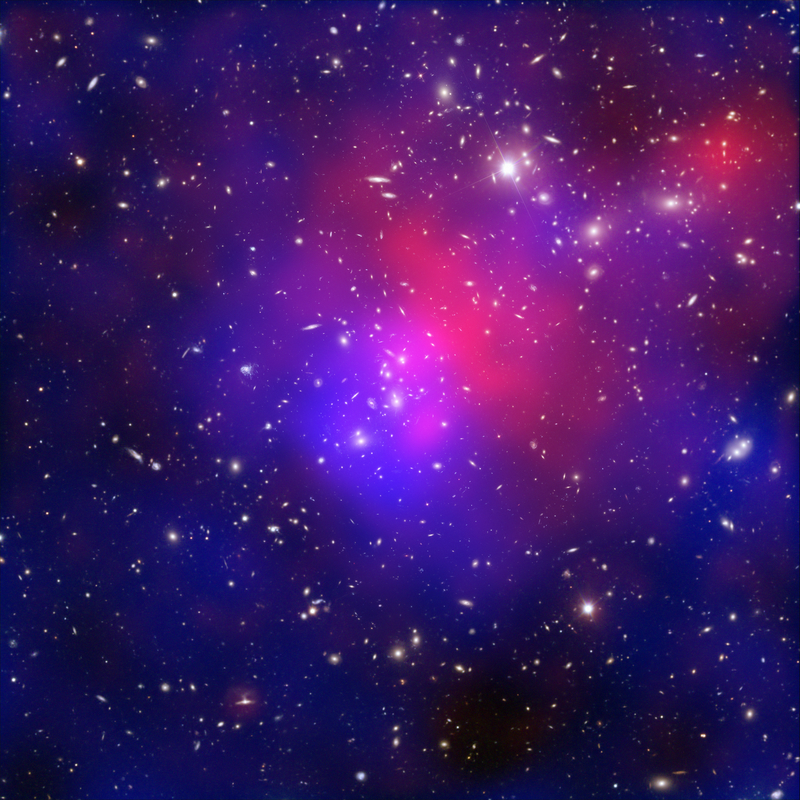 Recent studies have used gravitational lensing to map out the dark matter in colliding galaxy clusters and a second more detailed look at the Abell galaxy cluster to see if the dark matter lags behind the stars due to some new dark matter self-interaction. On the larger scale of galaxy cluster interactions, no evidence was found that the dark matter halos of the clusters had interacted (i.e. they still followed the stars). But on the smaller scale, a displaced lens of mass was detected approximately 4,500 lightyears behind the stars. The stars had raced ahead of the majority of the mass giving the lensing signal, which is the dark matter. The greater the distance the dark matter lags behind the stars, the greater the dark matter particle’s cross-section which can rule out certain candidates. On small scales there is now tentative evidence that dark matter appears to interact/collide at least a little with clouds of dark matter travelling in the opposite direction. On larger scales we have the tightest constraint yet on how much it can interact with itself. Between these two lower and upper bounds lie a lot of potential candidates but these two results suggest astronomers may finally be honing in on the elusive dark matter particle - although uniquely confirming the exact candidate will require finding it in a lab on Earth. This work is therefore particularly timely as funds have been awarded for the world’s first southern hemisphere direct dark matter detector in Stawell, Victoria. Housed at SUPL (Stawell Underground Physics Laboratory) experiments will try to detect the collision of dark matter particles with atoms and confirm the exact particle responsible and finally bring dark matter into the light and glare of particle physics.